Be the first to share your favorite memory, photo or story of Shaun. This memorial page is dedicated for family, friends and future generations to celebrate the life of their loved one. 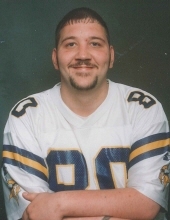 Charles Shaun Curtis Finley 36 of Ashland passed away Sunday, December 02, 2018 in King’s Daughters Medical Center in Ashland. Shaun was born February 19, 1982 in Ashland to the late William “Bill” Wheeler and Lula Manning Finley. In addition to his parents he was preceded in death by his daughter Kelsea B. Finley and his brother Dustin K. Finley. He leaves behind two daughters Kirstin Finley and Brittany Finley both of Ashland; three sisters Brandi Webster (Brent) of Westwood, Chrystal Spreacker (Don) of Ashland and Misty Finley (Louis) of Louisville; one brother Billy O. Finley of Ashland; Amanda Rice who held a special place in his heart; Peggy and Mike Roop who are the grandparents of his children and took special care of Shaun; along with a host of extended family and friends. Funeral services will be 1:00 PM Wednesday, December 05, 2018 at Caniff Funeral Home with Rev. Jimmy Webster officiating. Burial with follow in Dixon Cemetery. Visitation will be Tuesday from 6-8 at the funeral home. To send flowers or a remembrance gift to the family of Shaun Finley, please visit our Tribute Store. "Email Address" would like to share the life celebration of Shaun Finley. Click on the "link" to go to share a favorite memory or leave a condolence message for the family.